On a scale of one to 10, with one representing the worst and 10 the best, Stuart Bowen would put the current situation in Iraq at zero. Their discussion was focused on four Middle East issues: Iraq, the Islamic State group, Islamism and democracy. Bowen’s perspective is shaped by his decade-long tenure as inspector general for Iraq reconstruction. In his view, four arcs of history collided during the 2003 invasion of Iraq. There was the millennia-old sectarian arc between Sunni and Shiite Muslims, the centuries-old ethnic arc, the continuing reverberations of colonialism that arbitrarily divided the Middle East and the totalitarian arc that has gripped the region in recent decades. The collision of these arcs opened “Pandora’s box” for the region and made the worst case scenario imaginable a reality, according to the speakers. Hamid was in Egypt the day former president Hosni Mubarak was deposed, Feb. 11, 2011. He witnessed firsthand the power of the Arab Spring and, unfortunately, its failure. The end of the Arab Spring was effectively Aug. 14, 2013, which saw a military coup wrest control from Egypt’s democratically elected president Mohamed Morsi, who, by all accounts, was not popular, Hamid said. During the revolution, approximately 800 people were killed in broad daylight. It forced Hamid to confront the nature of evil as well as the efficacy of democracy in practice versus the abstract. Many Middle Easterners view government as an existential “zero-sum game” because they are not willing to deal with the consequences of elections they do not like, he said. Iraq is in a similar situation. Former Prime Minister Nouri al-Maliki holds most of the blame for the derailment of Iraqi reconstruction, Bowen said. He was removed in June 2014 and fled to Iran last Friday after a parliamentary report found him responsible. Under al-Maliki, corruption flourished, recently resulting in the loss of electricity and mass protests. 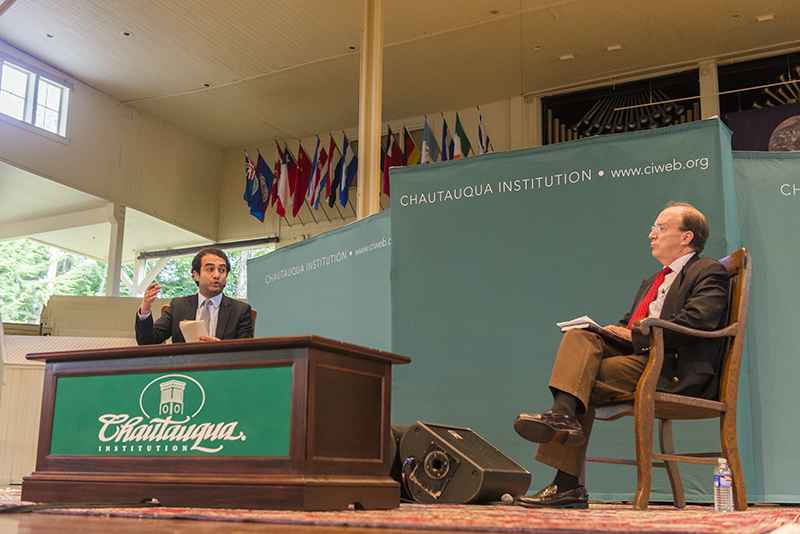 The challenge was to understand the Islamist mindset that dominates the Middle East, Hamid said. He spent more than 100 hours with Islamists from Egypt, Turkey and Tunisia to do just that. He said there are far-right radicals, such as the Islamic State group, that even al-Qaida distanced itself from, and mainstream parties such as the Muslim Brotherhood, which has a ruling majority in Turkey and includes Morsi among its members. “Some Islamists are very different than others to the extent that ISIS would consider the Muslim Brotherhood to be unbelievers,” Hamid said. The assumption that antagonism stems from political power is inaccurate, he said. One of the people Hamid interviewed, a member of the Muslim Brotherhood, said he joined because he “wants to get into heaven.” From a different point of view, it is perfectly rational, Hamid said. For them, religion offers what politics can’t. The Islamic State group is the latest outgrowth of the jihadist movement against the West, tracing its origins back to 1979, Bowen said. That was the year the American embassy was overrun in Iran, Saddam Hussein came to power in Iraq and the Soviet Union invaded Afghanistan. This confluence of events set into motion the terrorist activities throughout the 1980s, ’90s and 2000s. “If democracy is to succeed in Iraq — indeed, in the early years there were successful elections — can we see it succeed in an Islamic setting?” Bowen asked Hamid. Hamid said democracy in the Middle East cannot succeed without theocratic Islam. He said many Middle Easterners believe clerics and religiously derived punishments should be part of their governance. Thus, it is important to distinguish between procedural democracy and Westernized, liberal democracy, he said. Whether the region and Islam will undergo a reformation and become more secular and liberalized, as some argue, Hamid is hesitant to say. With no clear solution, Hamid said the West had to practice coming to terms with Islamism or, more broadly, religion playing a large role in the Middle Eastern countries’ quests for democracy. Bowen said the path forward needs to be paved with a partnership against the Islamic State group, which he does not see happening without military intervention of some kind. He noted most of the U.S. aid meant to build infrastructure was improperly taken and held by these criminals. The Iraqi government needs to root out corruption and prosecute its perpetrators.